We're pleased to present an interview with Brian Rowe, author of the upcoming YA fantasy novel Over the Rainbow, which re-imagines The Wizard of Oz in a modern setting. I am excited to read this one, and I hope you are too! Check out Brian's answers to our questions, and then enter a giveaway to win a copy for yourself! A modern re-imagining of The Wizard of Oz! 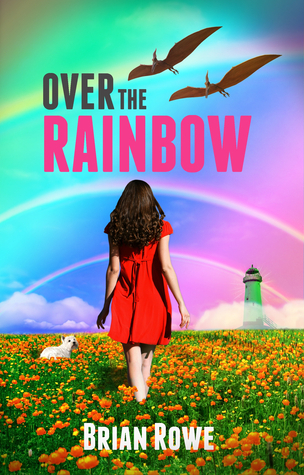 Aside from Over the Rainbow, you're the author of several books across all sorts of genres. Did you always know that you wanted to be a writer? Do you have any advice for aspiring writers out there? Yes, I always knew I wanted to be a writer. I started writing short stories in the third grade and never really stopped. I detoured into screenwriting for a bit, from around 2002 to 2010, and in that time wrote 60-70 short scripts and 5 feature-length screenplays. But then in 2010 I decided it was time to write a novel, and I had so much fun with it that I decided I wanted to focus on fiction writing full-time. My advice for aspiring writers out there is to just write every day. And write what compels you. Don't write what you think will sell, or what your friends or what your family want you to write. Just be you, and you'll go far. If you can share without spoilers, what was the most fun scene for you to write in Over the Rainbow? The most fun scene to write in Over the Rainbow? Wow, that's a tough one. There are so many scenes I had a crazy amount of fun writing. You might think the more action-packed scenes toward the end would have been the most fun to write, but actually those were the most difficult, especially when I had to figure in six characters. I love the first scene, but first scenes are always hard because it's the one you obsess over the most; it's the one that needs to draw readers in so with each subsequent book I write the very first scene always gives me more and more anxiety. I would say the most fun scene to write in the book was the Alice in Wonderland dream scene. It makes me smile every time I read it, and I hope you all like it, too! Do you have any special writing habits or rituals? When I write the first draft of a novel, I keep to a strict schedule of 2,000+ words a day, every day, until the manuscript is complete. Some days I'll write 2,800 words. Others I'll write 2,005 words. But I never deviate from this schedule, never once in the twelve books I've written in the last three years. People ask me how it is I've written twelve novels in the space of about 38 months, and I tell them, I write every day. I've had days recently where I literally revised one book in the morning, worked on the first day of another book in the afternoon, then spent all night promoting Over the Rainbow. I look at my writing career as a marathon, not a sprint, and I know in my gut all this hard work will pay off one day. You successfully raised funds on Kickstarter to publish this book. What was the biggest surprise for you in this experience? I had been intrigued by Kickstarter for a couple years now, and I always wanted to give it a try. When I looked at the price tag of everything I was putting into Over the Rainbow, from marketing to copyediting to the cover to Netgalley, I realized I was looking at $1500+. I don't exactly have a lot of money, so I turned to Kickstarter for some help. I could have just published Over the Rainbow with not a dime put into anything, but that's what I did with my last young adult trilogy, and none of the books really went anywhere. I believe in Over the Rainbow so much that I decided to need to step up this time and really do my best to get the word out. Kickstarter was such a great experience, and I'm excited to do it again with some of my future books, if I choose to self-publish them. The biggest surprise for me was probably the outpouring of support on the last day of the campaign. With 24 hours to go, I was at about $1200, and I needed $300 more to get to my goal. I went to bed that final night terrified I'd be just a few bucks shy, but when I woke up in the morning, I found that not one person, but two, had donated $100 to my project during the night. I couldn't believe it. I actually teared up a bit. There are some very generous people out there who want to see your creative project succeed, and I couldn't have done all I have with Over the Rainbow if it had not been for the awesome people who donated to my book on Kickstarter! My favorite book of all time is Boy's Life, by Robert R. McCammon. I read it in the summer of 2000, before my sophomore year of high school, and no book I've read before or since has put me under its spell like that one. I have given it to friends, I have talked it up in writing classes, I have preached the greatness of this wonderful novel to anyone and everyone who will listen. If you've never heard of it, or of Robert McCammon, I implore you to check it out. You won't be disappointed! After Over the Rainbow, what's next for you? I am currently working on three upcoming books. The first, Crashing Into You, is my first New Adult novel, and I will be self-publishing it in November. It's a contemporary romance with a trace of mystery and intrigue. The second, Magic Hour, is my first gay young adult novel to focus on a gay male, and it tells of a wedding videographer who accidentally makes a bride and groom disappear. This book is currently out to literary agents. The third book, The First Day, I completed the first draft over about a week ago. This book tells of a romance that blossoms between two gay boys over the course of 12 years. Think that book One Day, but with a gay relationship. I also have a sinister young adult thriller in the works, as well as my first literary adult novel, which will be based on a short film I made in college. Both of these I will be starting in 2014. The Scarecrow :) Thanks for sharing! The Lion .. because even the strongest have their times of lack of courage.